I doubt that the 21 Cermak or 90 Harlem extension will be cut back. Just have the 307 and 322 make limited stops between Grand/Harlem and Harlem/Lake and 54th/Cermak and North Riverside Mall. I'm sure that in the future, there will be a resolution about duplication of service. What is your opinion on the Pace 2nd Round of South Cook-Will changes? I still feel that Joliet is still not connecting to South/Southwest routes other than Orland Sq. I guess it is a work in progress but hopefully it will get better. I like all of the proposals, with the exception of #382. I mean, what is the point of keeping that route if it's only running to 73rd/Oak Park. I wanted to ride #382 all the way done to it's only terminal, but since it's getting cut to 73rd, I can't. I believe our lovely Cermak route is route 21. And the reason why the 21 was extended in the first place was because more of the city wanted to travel west to go the mall without transferring to another bus and to merge with the old 25 West Cermak. I don't think they should drop that service if more folks are riding it. And I don't think CTA would take heed to stop the duplication of service. Although I'm happy that Pace is taking the steps to stop the duplication of service. Like what I said about the Western Situation. Like I stated they should extend the 49 to 95th street for at least 5am-1am and get rid of the 49A. Because how it is right now, there wont be any local service on Western South of 79th and North of 95th unless people would have to walk blocks to catch the 87th Street bus. This is what I'm also saying with the 8 Halsted. CTA should find some land to make a turnaround adjacent to 95th street so they could extend the 8 to 95th and get rid of the 8A and keep the 108 running all day from 95th and 127th. The reason is you have too many 79th Street buses running and It wouldn't hurt to transfer at 79th and Halsted. And this would at least put more hours on Halsted between 79th and 95th. And I mean come on, they have alot of things that CTA can do to get rid of duplication. And I mean what's the point of having the 17 Westchester running only on rush hour. 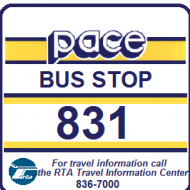 Pace can run the 317 all day. Why can't Pace do it? Even though I was baffled about dumping the 355 but more folks would take heed of taking the Metra Train. I wished that they would've at least had some of those or extend the 350 Sibley to merge with the 355 route from Lansing to hammond and serve Sibley straight down and it would eventually go accordingly with the Metra's Arrival/Departure times. I dunno if this planned 889 would go through. This would also be like when they operated the 396 Rosemont to UPS Hodgkins where they were only 2 Passengers getting on the bus everyday. I really think that they are pulling a big gamble if they are going to follow through with this route. I do like that if they do get their money, the 386 will use 73rd Street instead of 63rd and will also use 183 to Wood Street to serve the portion of current 352. Now I know that South and Southwest will share operations if they do operate this. Once again, I dunno what the state will do but I think they are taking too long to deal with what they have to do. I'm just hoping that they would do the right thing because I know that they don't want to get the City to shut down if reductions of service follows through. 382 is only being kept in the short term plan. The long term plan is to reroute 386 on 73rd, which covers the industrial area and eliminates overlap on 63rd, and eliminate 382. In the meantime, the industrial area has to be served. The 355 will not run at all anymore that will be cut. The 349 will only go to 95th and western. the 357 will go to Joliet and will stop at Lincoln Mail. the 358 will go down rt 30 to Lincoln Mail. The 370 will be cut. I will find out more asap. All of what pace2322 stated was true. The 349 will only go to 95th and western. Yes. 352 will run with only like 6 city stops. No more express buses down i-57 to harvey. Yes. the 357 will go to Joliet and will stop at Lincoln Mail. Nope, it gets eliminated because of the next one, and the proposal to extend 506 between Joliet and Chicago Heights wasn't in the second round, either. the 358 will go down rt 30 to Lincoln Mail. Yes. The 370 will be cut. Somewhat correct, although 352 takes over the route, and the proposed 386 takes over the 352 segment between Harvey and Homewood. The score looks like 4 out of 6, giving half a point each for 1 and 6. B) So now what is the purpose of a PSCW restructuring plan if these routes are to have service cuts before they are implemented? I mean no weekend service on the 349, 352, 353, 364, and 381? Did PACE state that these routes are in the top ten in ridership? So you want me to believe that jobs will shut down because of no bus service on weekends or we won't have a job to go to because we cant get there? This is really drastic thing to do, esp with the other cuts in ADA, feeder shuttle bugs, UPS. Its sad. Politics is really stinking up the joint here. So now what is the purpose of a PSCW restructuring plan if these routes are to have service cuts before they are implemented? Pace, whether intentionally or not, is playing carrot and stick. If you receive the Moving into the Future newsletter, there have been various recent issues (not yet posted on the Pace site) indicating, for instance, if it you use their link to contact your legislators, and Pace gets the Moving Beyond Congestion money, the South area will get the improvements promised. The displays at the hearings also state that the ones scheduled for early 2008 need additional funding. On the other hand, their home page tells you that if they don't get the money, you get the cuts. One way or another, 831 and 835 will be cut. What might be illogical if the plan is as presented (and most of us on this forum have agreed that both plans offer a meataxe approach) is that eliminating the portion of 355 from Sibley into the Loop, while part of the restructuring, is not part of the doomsday plan, even though the poster at the restructuring workshop said that that route added $1 million to costs, because it returned empty. Also, maybe Joliet doesn't receive as drastic bus cuts if the funding isn't there for the proposed west side DARs (I don't see anything in the 501-507 series in the totally eliminated fixed or feeder route lists). That might be a false economy. One way or another, 831 and 835 will be cut. The one part of this prediction that has come true prematurely is 835. According to the Pace home page and the Passenger Notice, that gets eliminated on August 17. Pace is even offering to refund unused parts of 10 ride tickets. I'm still somewhat surprised that the proposed 355 cut north of Sibley wasn't on the fast track. But, then would it become a Metra feeder and that segment would be killed, too?? Since funding may be on the way for pace how long do you think it will take for the South Cook-Will Restructuring to begin? My understanding of the bills (again, we have to wait to see if the final agrees with prior strips) is that the South Cook-Will restructuring is mandated, as well as an I-55 BRT. So, it probably won't be that long, although given that it needs a third round of hearings and the like, I would bet probably around summer. See post 8403 in the Legislative Update topic for my analysis of the legislation sent to the governor in this regard. Probably as relevant here as anywhere, and in response to those who say malls need transit, is the announcement that Matteson is trying to shut down the Lincoln Mall for building violations. Of course, it is served once every half hour by the 357 bus, as indicted by the embedded video in the Tribune article. Also, the Lincoln Mall ran the Park Forest Mall out of business. If you see a Passenger Alert that the bus is no longer stopping at the mall, you know why. The question is going to end up being is, if they do shutdown the mall in Matteson, where the buses are going to terminate? I don't think Pace has though of some sort of contingency, if that ever occurs. The terminal is Southwick Dr. The current schedule says Lawrence Manor, which apparently is the same thing. Some reports are that Carson's is not affected, but I don't see the bus traversing the parking lot just for that. Passenger Notice that the South Holland Park and Ride will be eliminated Aug. 15. I thought this was supposed to be done as part of the restructuring in this topic, but is being done now. Looks (from the description in the Notice) like the names of the routes are being changed, consistent with the change to 626. Public Hearing Notice that service on 511 will be expanded. Strange that they would hold a public hearing on an expansion. 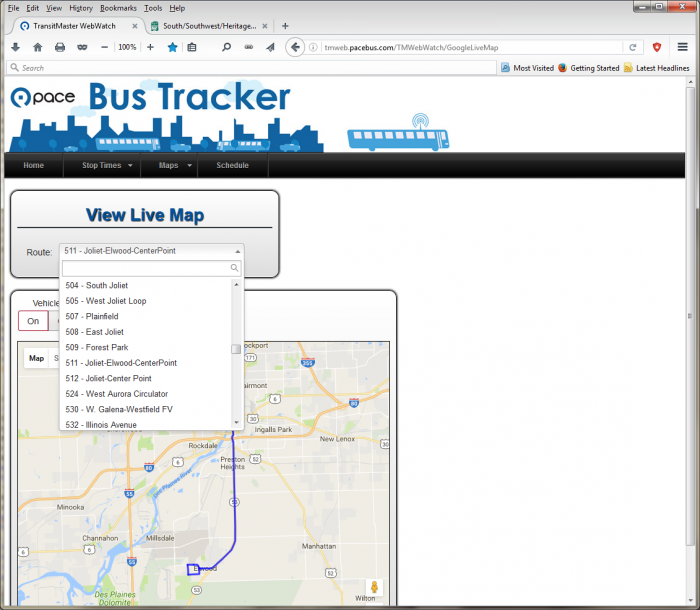 "proposed expansion of service on Route 511 Joliet-Elwood-Arsenal to serve a distribution center via a bus turnaround off Vetter Road in Joliet." That is strange. I'm not quite sure how to interpret the phrase that I quoted above. My best guess is they are referring to the Stepan company, which has a "distribution center" building near where the current route already stops, but whose main facility is at the end of a dead-end road, hence the need for a bus turnaround. This sounds like a relatively minor routing change, with no significant schedule changes or additional trips. It's not much of an expansion, so I don't see a need for a public hearing either. I might stop by the public hearing if I don't have anything else to do, but I wouldn't be surprised to be the only person there. My best guess is they are referring to the Stepan company, which has a "distribution center" building near where the current route already stops, but whose main facility is at the end of a dead-end road, hence the need for a bus turnaround. The map also shows a Stepan distribution center east of where you marked, and east of Millsdale Rd. Again, on the strange point, there were hearings when employers dropped off the Shuttle Bug system, but not when one was added. This appears only to extend the route one block. Also, the schedule now says operated by Pace Heritage Division. It used to be operated by paratransit with a community vehicle. Is it now using a real bus? It is still operated with a community vehicle, #14401 which has "511 Elwood" decals on the front and back. Wayback machine shows it was operated by Heritage on 4/30/2004. Service began 3/1/2004. New series (XX400s), same decals. On "operated by" I might have got it confused with 510. Anyway, a community vehicle indicates there shouldn't be any "bus turnaround" problem. Changes are announced. There will be a new route 512, which just looks like a short trip on 511 so I don't know why it needed its own route number. 511 will now get back to downtown Joliet at 5:11 PM instead of 5:06, which ruins the connection with buses that leave at 5:10, but the schedule change probably reflects existing OTP problems. If they had announced the exact proposal ahead of time, people may have been inclined to go to the hearing. Mars is the "distribution center" alluded to previously, not Stepan. 511 and 512 could be interlined. If that's the case, they'll have to change the decals if the route continues using a community vehicle. The timing of 512 is similar to what 511 was prior to the 2008 restructuring. 512 isn't bidirectional like 511 is. 511 had a name change from "Arsenal" to "CenterPoint", but 512 doesn't have the P in "CenterPoint" capitalized. The only inference I can make from this schedule is that someone in the Vetter area was willing to pay for a later shift start time and an earlier shift finish time, and I bet it is not the same company for both. Undoubtedly the same vehicle, and I sort of doubt that the pulse point buses would leave a minute before 511 actually arrives. If that was the fear, they could have scheduled the start time for 511 one minute earlier. But my bet is that riders on 511/512 are heading for Metra. The riders would not be going to Metra, because the first outbound train in the morning doesn't get to Joliet until 7:23 AM, long after 511 & 512 have departed. The only routes that run early enough in the morning are 508, 509, and 834. Trips on those routes are specifically timed to connect with 511. Somebody could transfer to Metra in the evening, but why would they if there is no morning equivalent? This is probably the explanation for why 511 has such low ridership, and making the afternoon transfer less convenient won't help. I've actually observed that it's not unusual for 511 to have a few riders on the southbound afternoon trip at 4:11 PM. I don't know if those are primarily people who live in Elwood, have someone to give them a ride for the reverse trip, or happen to work a 12-hour overnight shift. I've seen people coming from the west side of Joliet on 501 and from Orland Park on 832 to transfer to 511.